Owning a piece of Tiffany and Co. jewelry is every girl’s dream, but if your once favorite item is like mine collecting dust in its box it may be time to part ways. Why not sell it to people that buy used Tiffany jewelry and convert your treasure into cash? Did you know there are people that buy used Tiffany jewelry and convert your treasure into cash? Selling your jewelry is not a bad idea, especially when you know when the market is strongest. Follow each of these steps below for the best results:. Have your jewelry appraised. Tiffany does not offer appraisals but instead advises owners to have an appraisal done at a reputable jewelry store (some stores charge for appraisals, so ask the store beforehand if there is a fee). You might also consider going to a couple of different pawn shops to get an idea of how much you should expect to receive (you can sell your item to the pawn shop right there, but be advised that the pawn shops will offer you the lowest amount possible). Look for upscale jewelry stores in your location. If you’re wondering how to sell Tiffany jewelry for the highest return, consider locating a jeweler who will sell your piece on commission. This method takes a little more time, but the jeweler typically has a customer base that understands the worth of your piece and isn’t going to balk at the price. Sign a consignment agreement ahead of the sale, and keep you copy of the agreement. Make sure that, if the piece does not sell within the agreed upon time frame, the piece is returned to you. 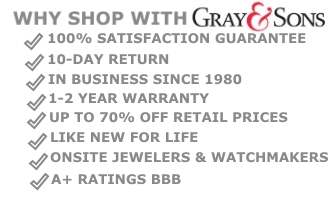 Sell your Tiffany Jewelry to Gray and Sons, Boca Raton! Request a pre-labeled, Easy Ship box and mail us your item. 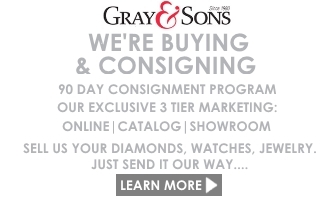 After verification, Gray and Sons will contact you with a price or consignment terms. As one of the more affluent areas in Florida, it’s not surprising that Boca Raton residents have pieces of estate jewelry or other pieces of jewelry that are no longer worn. A reputable jeweler can purchase and/or consign your jewelry pieces to get you the highest price. Sometimes, a piece of jewelry’s appraisal value differs from the price someone is willing to pay you for it. ‘Appraisal value’ is a term often used by insurance companies to describe how much you are entitled to if their policy must cover the loss of your jewelry. The purchase price can vary widely depending on several factors: famous brand names add value to a piece, as does fashionable design. Also, the best times to sell your jewelry are just before holidays like Valentine’s Day, Mother’s Day and Christmas. Sell us your Jewelry Today! As one of the largest jewelry buyers to Boca Raton residents, Gray and Sons is the best place to sell your jewelry for the best price. We purchase diamonds, fine timepieces and estate jewelry. Our in-house experts range from certified gemologists to Swiss watch experts with decades of experience in the industry. Our customers are mostly repeat customers who can attest to our unparalleled service and reputation for honesty. Often, selling your jewelry can mean letting go of the emotional ties you have with the item, so we strive to keep the experience a pleasant one. Gray and Sons’ showroom is located just right across the street from prestigious Bal Harbour. Please visit us! Boca Raton ,a city in Palm Beach County, Florida, is located 43 miles north of downtown Miami. With an estimated population of 89,407, it is the largest city between West Palm Beach and Pompano Beach. Boca Raton got its name from the Spanish word “boca”, meaning ‘mouth’, and “raton” meaning ‘mouse’. From beaches and golf courses to luxury hotels and art museums like the Wick Theatre & Costume Museum, Boca Raton is the perfect getaway for you and your family. Gray & Sons Copyright © 2019.